Washington, Sep 7 (IANS) A coalition of 16 US attorneys general has sued President Donald Trump’s administration’s decision to end a program which shields more than 800,000 undocumented immigrants who arrived in the country as children, from being deported. 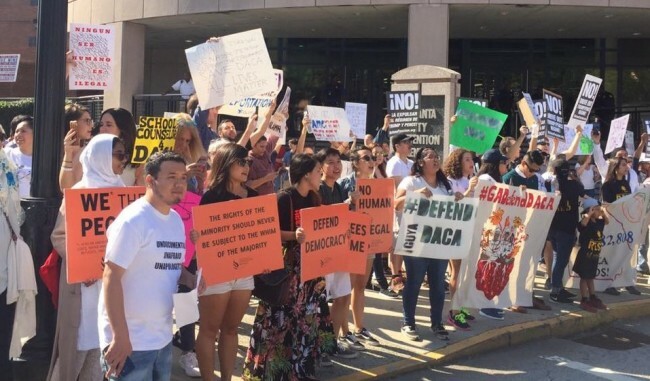 The coalition filed the suit on Wednesday in a New York federal court against the decision to end the Deferred Action for Childhood Arrivals (DACA) program, reports Efe news. In their lawsuit, the prosecutors from the states of New York, Massachusetts, Washington, Connecticut, Delaware, Hawaii, Illinois, Iowa, New Mexico, North Carolina, Oregon, Pennsylvania, Rhode Island, Vermont and Virginia, as well as from the District of Columbia (Washington D.C.), said the decision announced Tuesday by US Attorney General Jeff Sessions would harm their states’ residents, institutions and economies. They also argued that bringing an end to DACA, which was implemented by former President Barack Obama created in 2012, unfairly targeted Mexicans (who make up 78 per cent of the program’s beneficiaries) and thus violated the US Constitution’s equal-protection clause. “As President Trump’s statements about Mexico and those with Mexican roots show, the President has demonstrated a willingness to disparage Mexicans in a misguided attempt to secure support from his constituency, even when such impulses are impermissible motives for directing governmental policy,” the coalition wrote. Sessions said on Tuesday that the programme to protect so-called “DREAMers” would legally end within six months, a window that the Trump administration says Congress can use to pass an immigration-overhaul legislation. DREAMers are potential beneficiaries of the Development, Relief, and Education for Alien Minors (DREAM) Act, a bill that has been introduced to Congress in numerous versions over the past 16 years in an effort to provide a path to legal status for individuals who were brought into the US unlawfully before the age of 16 and meet a series of other requirements, including passing criminal background checks. New York Attorney General Eric T. Schneiderman said on Wednesday in announcing the lawsuit he is co-leading that the DACA beneficiaries deserved protection. “By definition, DREAMers play by the rules, DREAMers work hard, DREAMers pay taxes. And, for most, America is the only home they’ve ever known. They deserve to stay here. “We are suing to protect the rights of DREAMers, the rights of employers who rely on them, the schools they attend and the rights of the millions of friends and relatives who love them,” Schneiderman added. In support of their argument that Trump’s decision violates the constitution’s equal-protection clause, the attorneys general pointed to derogatory remarks the Republican made about Mexican migrants on the campaign trail. Trump launched his presidential campaign in 2015 by saying most Mexican undocumented immigrants were people with lots of problems and that failure to implement tough immigration policy had resulted in crime, drugs and even “rapists” spilling across the border. The lawsuit also argues that DREAMers had made themselves more vulnerable to deportation than they were before DACA because they had provided sensitive information when applying for the programme. The Trump administration’s announcement of an end to the programme has sparked nationwide protests, including in New York, where 70 people were arrested for acts of civil disobedience.